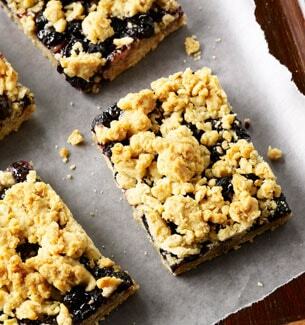 An oat-crust layered blueberry treat topped with buttery streusel. blueberries, wheat flour, brown sugar, palm oil shortening, butter (cream [from milk]), rolled oats, organic tapioca syrup, sugar, oats, water, whole eggs, baking powder (sodium acid pyrophosphate, cornstarch), rice starch, organic natural flavor, stabilizer (sodium alginate, tetrasodium pyrophosphate, calcium sulfate), sea salt, citric acid. Blueberries loaded on a large crust of oatmeal and topped off with a generous sprinkling of mouthwatering buttery streusel. Is there a better reason to enjoy this treat? We say no – the fact is, it’s a great treat for special occasions – like right now. The blueberry is one of the few fruits that are native to North America.